BARRAGAN and MONTERREZ kennels are owned by Neil Curwen and Graham Cruse. We are located at Silverdale on the outskirts of Sydney Australia. We currently breed and show Cairn Terriers and Schipperkes. Our last Pointer litter was in early 2011 of which we kept a male that we show. Both of our kennels have been established for over 35 years. We have bred champions in Australia, Great Britain,New Zealand, Luxemburg and Ireland, as well as 2 International Champion Schipperkes. We have owned or bred champions in the following breeds; Pointer, Cairn Terrier, Schipperke, Weimaraner(Smooth & Long Coated), Dalmatian, Jack Russell Terrier and Bedlington Terrier. At last count our Champions numbered 80 Australian, 9 UK, 3 Irish, 2 New Zealand, 1 Luxemburg, 2 International, 4 Australian Grand and 9 Australian Supreme Champions. We have bred Best in Show winners in the following breeds; Pointer, Rottweiler, Schipperke,Cairn Terrier & Weimaraner. Some of the highlights of our time in dogs has been. Breeding the youngest Grand Champion Pointer in the history of the breed. 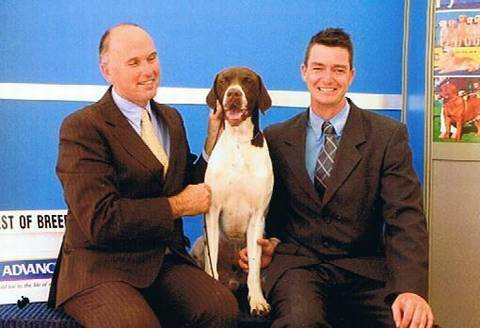 Breeding NSW Puppy of the Year 2005 and Runner Up Puppy of the Year 2005 in WA with Pointer litter brothers. Breeding the youngest Pointer to win a Best of Breed at a Royal Show at the time. Breeding and showing the only Schipperke to go All Breeds Best In Show in Ireland. Breeding a Crufts Challenge winning Schipperke. Breeding multiple English Champion Schipperkes. Breeding multiple Speciality Best in Show winning Schipperkes both in Australia and the UK. Breeding multiple Junior Warrant Rottweilers and Schipperkes. Graham is an International All Breeds Judge. Graham has judged extensively in the UK, Ireland, Australia,New Zealand, South Africa, Thailand, China,Japan, Philippines & Malta. Neil is licenced to judge for Terriers,Gundogs and Non Sporting at Championship shows. Neil is an authorised microchip implanter. We are both members of the Schipperke Association of NSW. We are both members of Sydney Kennel Club. Neil is President and Graham is Secretary and web master.